Unfortunately for us week didn’t start on a very cheerful note. We had to rush our little one to ER with a dislocated elbow : ( It’s so heartbreaking to watch when your child is in pain, but thanks to the Tallaght Hospital staff who were very good and caring, within minutes she was her bubbling self. Thank God she is ok.
Thankfully the week wasn’t all that bad. This week my friend’s K. son A. turned 1! We had brilliant time celebrating his first birthday. With a lot of fun activities, delicious cake and good company. Bliss! I hope next week will be less stressful and I have more time just to enjoy sunny weather what we are having now. But for now, please enjoy this very easy and very delicious vegetarian quesadilla with simple salsa cruda! For salsa, combine all ingredients. Season more if required. Put in a fridge until ready to use. In a frying pan heat olive oil, add peppers, onion and garlic; cook for 5 minutes or until just tender. Season with salt and pepper. Remove from the pan. To the same pan place one tortilla. Evenly sprinkle about 20 g of cheese then over half of the tortilla spread ¼ of the vegetable mixture. 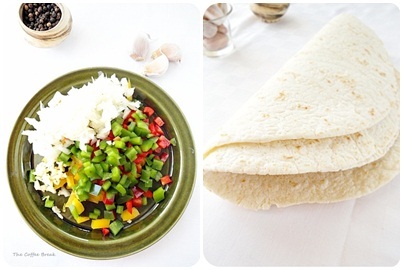 Fold the tortilla in half and cook for 2-3 minutes on each side. Repeat with the remaining ingredients. 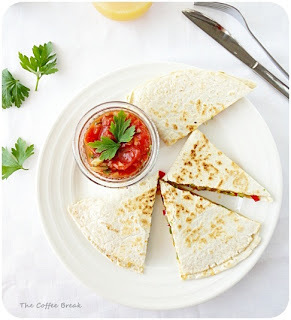 Cut each quesadilla and serve hot with chilled salsa cruda. Beautiful photos. I have all the ingredients except the peppers. Just popping down the shops and then this is on my lunch menu. Delish! Looks so incredibly yummy! great photos!